A common misunderstanding is the difference between a polish and wax, i hear a lot of people associate the two and believe they do the same thing. This is false, I cannot stress this enough, waxes and polishes are different and do different things, but the marketing people behind big car care brands don’t really care about definitions and will call a product anything that they think sounds good. Cleaning the engine bay is something most people never bother to do to their car. It may be because it seems like a lot of hard work however it is very simple and only takes a few minutes. A clean engine bay can add to the value of your car when it comes to selling it, and undoubtedly makes it easier for mechanics to make repairs and carry out inspections to ensure there are no oil leaks. Many people think you should not spray your engine with water, this is partly true. However, as long as you do not spray any of the electrics or air intake with water then you will have no problems, we have detailed thousands of engine bays with a high pressure washer and never had a single problem. Going a few weeks without cleaning your wheels and tyres can make them look very poor, especially the front which collects alot of brake dust and road grime, not cleaning your wheels on a regular basis can cause the brake dust to bake onto the alloy or even the plastic hub caps, this can easily damage the surface and it will need to be carefully cleaned with an acid based wheel cleaner which should only be used by a professional car detailer. You should use a good quality car wash shampoo, a wheel cleaner product (non acid) or degreaser, sponge and a brush if necessary to get between the gaps and behind the spokes, and also rubber or latex gloves to protect your hands from the wheel cleaner / degreaser. 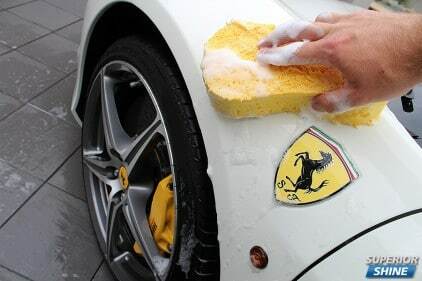 Many detailing enthusiasts and quality detailers use a two bucket method when washing a car, one bucket with soapy water and the other with clean rinse water. The rinse water bucket is used to rinse the dirt off your wash mitt after washing a section of the car. This method has two benefits, firstly it keeps the dirt and grit out of your soapy water where it could do damage to your paint work, secondly it makes the suds in your soapy water last longer. 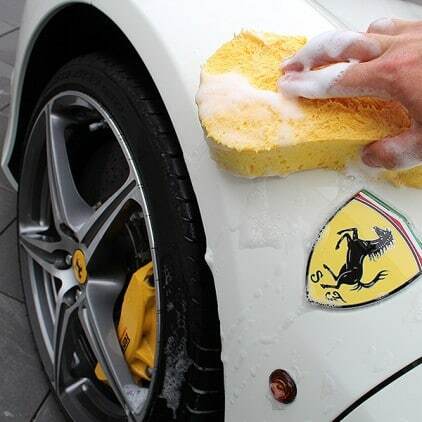 Never use the same water or wash tools on your paint that you have used on your wheels. Most high qaulity car wash shampoos are very gentle on the paint, plastic and rubber. A good car wash shampoo provides good lubrication between the wash mitt and the surface of the car to prevent scratching. Comments Off on Which Chamois To Use? One of the most common mistakes people make when washing their car is improperly drying and using a poor qaulity chamois. This is also one of the main causes of adding imperfections to your paint such as marring, swirl marks and scratches. A lot of people use leather or synthetic chamois; whilst there is nothing wrong with this they are however the most common to add swirl marks into the paintwork. People often excessively wipe the paint when drying until it leaves no streaks which induce scratches and swirl marks.